I have been wanting a serum that would work with my oily skin and my pores around my nose. 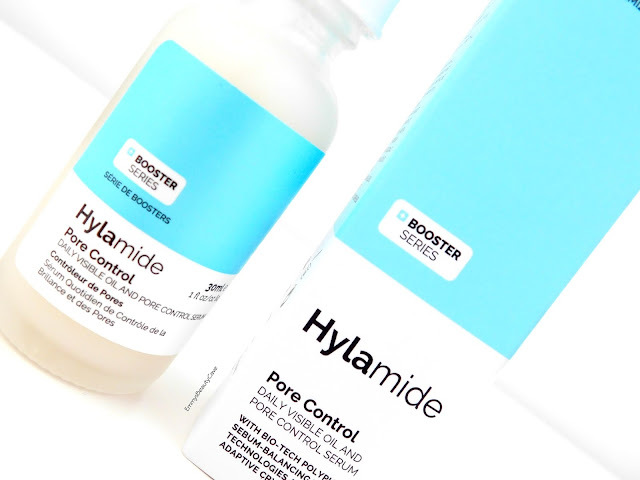 Hylamide is fast becoming one of my favourite skincare brands. They have so many ranges to suit all skin types. The Hylamide Pore Control Serum has definitely made its way into my skincare routine and I actually notice a difference when using it. I find with alot of skincare products they can feel nice on my skin but I barely notice a difference to my skin. The Hylamide Pore Control Serum is designed to reduce oil whilst still helping your skin to retain water and hydration. It also helps to minimize pores and reduce congestion. The serum itself is milky white in colour and it doesn't have that greasy feel like most serums. I have been applying this every night before bed for two months now and my skin looks so much better since using it. I love how quickly this sinks into my skin and it dries to a matte finish. When I apply it to my skin it has a cooling feeling which makes my skin feel refreshed. I have sensitive skin on my cheeks and this hasn't irritated them at all. Usually when I wake up in a morning my skin is slightly shiny but after a few weeks of using the serum I was noticing each morning my skin wasn't shiny at all. This is by far the best serum at controlling my oil. My pores look healthier and my skin just has an overall brighter complexion. I tend to use a mattifying serum in the evening and a hydrating one in the morning to help keep my skin balanced. I cannot recommend this serum enough for anyone who suffers with oily skin or large pores. If you are after a quick drying serum that actually makes a difference to your skin the Hylamide Pore Control Serum is the one for you. It retails for £23.00 for 30ml. As I said I have been using this serum every night for two months and I still haven't finished the bottle. It is 100% worth the price. You can buy the Hylamide Pore Control Serum from the Deciem Website or on many other online retailers.